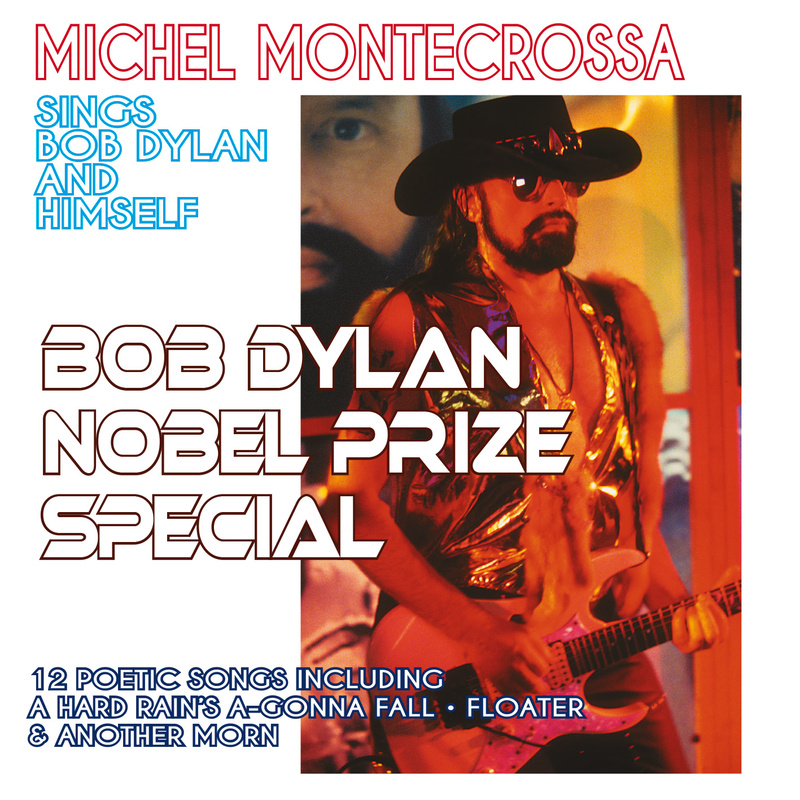 Today’s CyberRock Tuesday presents more songs from ‘Michel Montecrossa’s Michel & Bob Dylan Fest 2016’ – read here about the album (Audio-CD & DVD) and download it here from iTunes. 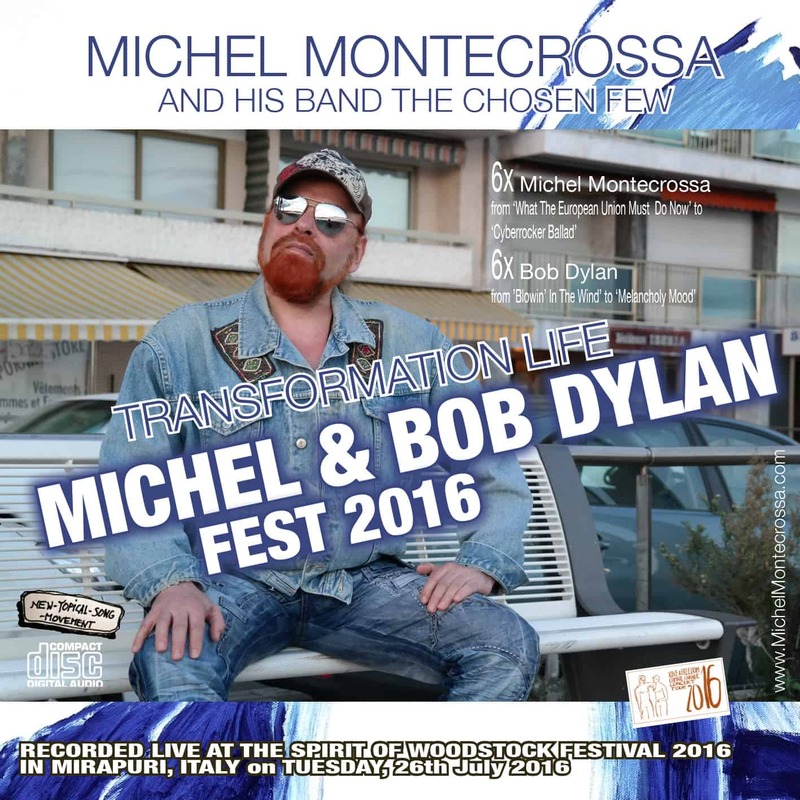 TRANSFORMATION LIFE Michel Montecrossa’s Michel & Bob Dylan Fest 2016 which was recorded live on Tuesday 26th July 2016 during the legendary Spirit of Woodstock Festival 2016 in Mirapuri is presenting the outstandingly revealing performances of 6 Michel Montecrossa songs and 6 Bob Dylan songs performed by Michel Montecrossa and his band The Chosen Few. TRANSFORMATION LIFE Michel Montecrossa’s Michel & Bob Dylan Fest 2016 begins with Michel Montecrossa’s brand-new after-Brexit Topical Song ‘What The European Union Must Do Now – Was Die Europäische Union Jetzt Machen Muss’, followed by the timeless Bob Dylan folk Protest Song ‘Blowin’ In The Wind’. The Michel Montecrossa Transformation-Reality-Song ‘No Sugar’ leads to Bob Dylan’s bitter-sweet look-life-into-the face Love Song ‘To Ramona’. Michel Montecrossa then goes on with his soulful ‘Woman & Man, Man & Woman’. The tender Bob Dylan song ‘Tomorrow Is A Long Time’ connects to Michel Montecrossa’s Mirapuri Song ‘The Place Of The Free’. In the thoughtful ‘Yes Or No Blues’ Michel Montecrossa asks his girl “Tell me girl: Are you ‘Yes’ or ‘No’, or have you found the middle? Tell me girl: Are you unbound or do you move in circles? It’s your mind. It’s your heart. It’s the whisper. It’s the star.“ Then he extends the seeking and finding emotion into the performance of the Bob Dylan song ‘Where Teardrops Fall’. The finale are the autobiographical ‘Cyberrocker Ballad’ by Michel Montecrossa, the self reflecting Bob Dylan song ‘Most Of The Time’ and ‘Melancholy Mood’, one of the Frank Sinatra songs which Bob Dylan also performed. all we do not know. of joy that will not hide. for all life to come. that alone can turn me on. in you is sweet and strong. 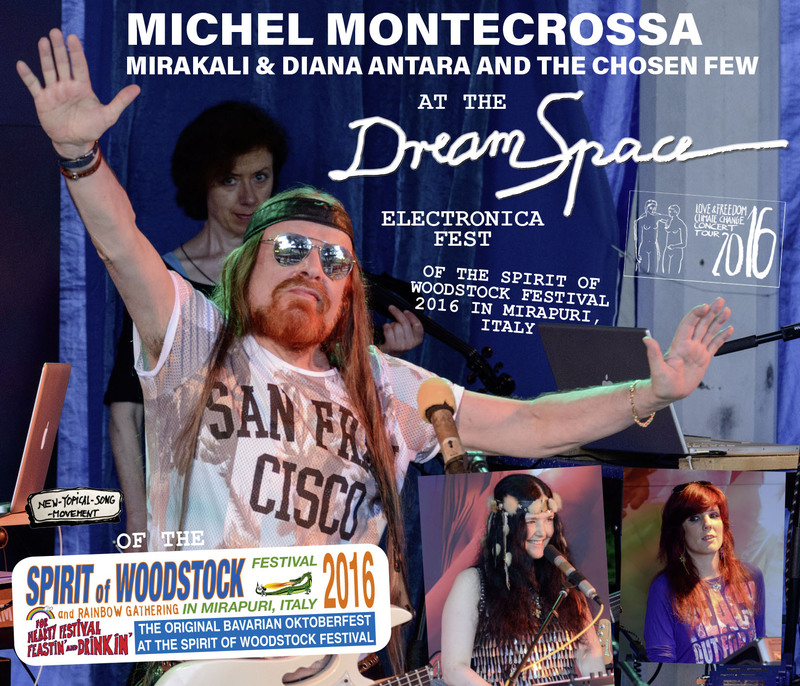 Michel Montecrossa’s powerful ‘Love & Freedom Climate Change’ complete concert series at the legendary Spirit of Woodstock Festival 2016 in Mirapuri, Italy, is released by Mira Sound Germany as two Boxes-Set with nine Audio-CDs featuring all 144 festival songs of Michel Montecrossa and Mirakali and Diana Antara together with their band The Chosen Few plus three Bonus DVDs: ‘Going To The Spirit Of Woodstock Festival In Mirapuri, Italy’, ‘Straight From The Spirit Of Woodstock Festival 2012’, ‘Greetings from The Spirit Of Woodstock Festival 2013’. The two Boxes-Set presents a sensual and stimulating variety of original music ranging from acoustic and electric New Topical Songs to consciousness enhancing Cyberrock and Dancedrive Hits as well as great Bob Dylan songs. 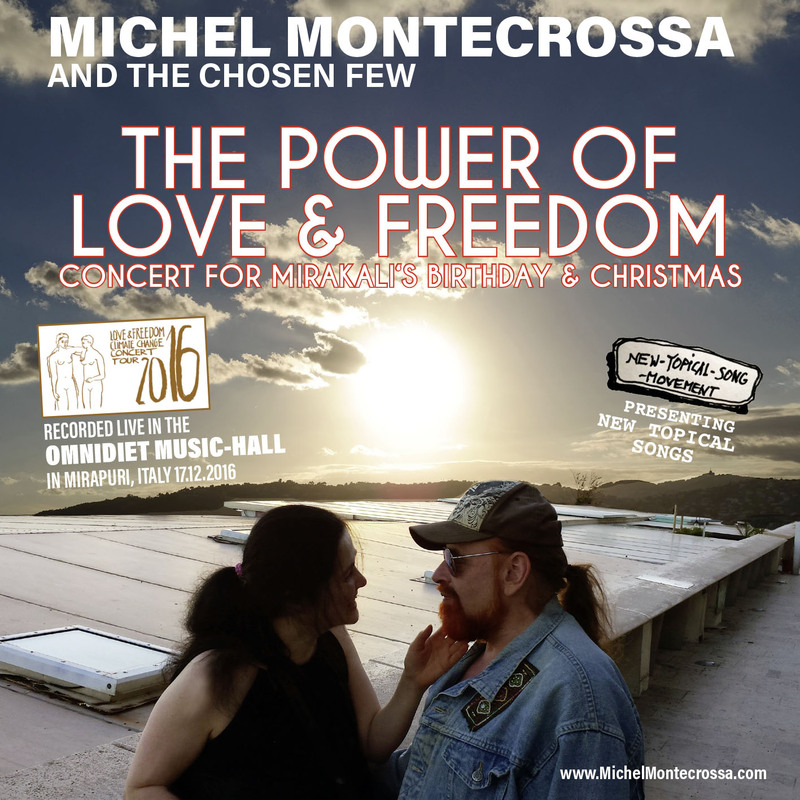 The 144 festival songs include profoundly visionary and empathic ‘Love & Freedom Climate Change’ songs by Michel Montecrossa, Mirakali and Diana Antara like ‘Festival Of Love & Freedom Song’, ‘Love & Freedom, My Love, I Am With You’, ‘Love & Freedom Showdown In The Making’, ‘Rettet Die Willkommens Kultur – Save The Welcome Culture’, ‘Refugees Blues – Flüchtlinge Blues’, ‘Meine Alternative Für Deutschland – My Alternative For Germany’, ‘The Day Of Love’s Compassion – Der Tag Mitfühlender Liebe’, ‘Große Party – Big Party’, ‘Küss Mich Noch Einmal’, ‘Looking Into The Sky’, ‘Sinnlich Mit Dir – Sensual With You’, ‘Met You In The Paradise – Mit Dir Im Paradies – Con Te In Paradiso’ and many more. 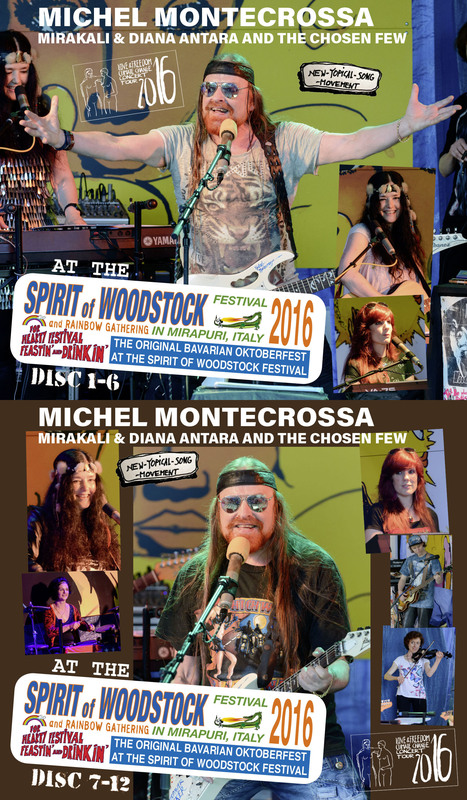 See here the complete list of all 144 songs performed by Michel Montecrossa, Mirakali and Diana Antara at the Spirit of Woodstock Festival 2016 in Mirapuri. The Spirit of Woodstock Festival 2016 Flashback presents images of all participating musicians and the soundtrack ’Festival Of Love & Freedom Song’ by Michel Montecrossa. Michel Montecrossa, Mirakali, Diana Antara, N.S.J.B., Electric Cake Salad, A.D.A., Anarcord, Sonicgum, Fran San Disco, Superjam, Bonies & Hot Sausages, Bruno De Rossi, The Bonneville, Micael Castor And Karen & Tommy, State Of Grace, Menny B. Good, Sticky Girls & Stupid Tables, Frozen Rain, Don Rodriguez. CyberRocker Michel Montecrossa started the Spirit of Woodstock Festival in Mirapuri together with the Mirapuri Rainbow Gathering and Mirapuri’s one and only original Bavarian Oktoberfest in Italy. to the Festival of Love and Freedom! there is magic and the power and the joy that are great. Baby, it’s the power of the Love and Freedom World. Oh, let the problems yes, all problems, be problems! at the Festival of Love and Freedom. Oh-ho-ho! At the Festival of Love and Freedom. the way of Love and Freedom strong. with you I eat and drink, make love and dance. at the Festival of Love and Freedom. Come on! The moon is there and the starry night. The people are happy, their smile is bright. the light of Love and Freedom. at the Festival of Love and Freedom. Oh, well! Earth and heaven, heaven and earth. The long way is longer without the one you love. The answer is simple: together we are strong. The rain is heavy, wild is the storm. The center of the cyclon is peace and calm. You may fight and struggle through error and pain. Behind the clouds the sun is always the same. where we melt into each other as eternity. and you love me, honey, you are my wonder-girl. life is sweet with me and you. The story, I tell you, is not meant to end. the warmth of the woman, the warmth of the man. And when you turn around, you’ll see me again. is the song for you from my soul. a free world alone can live the life of love. heißt das Lied für euch aus meiner Seele. Eine freie Welt allein wird retten unsere Seelen. Eine freie Welt allein kann die Liebe leben. A healthy world alone can protect our bodies. A healthy world alone can secure the life of love. Eine gesunde Welt allein kann unsere Körper schützen. Eine gesunde Welt allein kann sichern das Leben der Liebe. sings for food, water, jobs and success for us all. alone can give them to us all. singt für Nahrung, Wasser, Jobs und Erfolg für uns alle. allein kann uns diese geben.